If you use a notebook Mac — a MacBook, MacBook Air, and MacBook Pro — or a desktop Mac with a Magic Trackpad, you’ll have an additional System Preferences pane in OS X El Capitan called Trackpad. 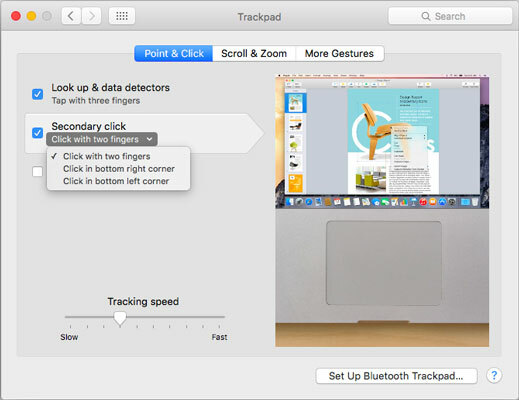 This pane lets you configure tracking and clicking speed as well as the gesturing behavior of your Mac’s built-in trackpad. If you’re looking for a replacement for your mouse, consider Apple’s $69 Magic Trackpad. This nifty wireless device can be used with any Mac or PC that has Bluetooth. It’s also the biggest glass Multi-Touch trackpad yet, nearly 80 percent larger than the MacBook Pro built-in trackpad. Yes, you can use the Magic Trackpad with your MacBook Pro, and yes, that does mean you have dual trackpads. The Trackpad System Preference pane has three tabs — Point & Click, Scroll & Zoom, and More Gestures — as shown here. The Trackpad System Preference pane offers controls for one-finger and multi-finger gestures. If you have an older notebook with the older-style trackpad, you may not see all the controls shown. All three tabs work the same way as the Point & Click tab shown. To enable or disable a feature, click its check box. To see how a feature works, just move your cursor over it (you don’t even have to click), and a movie demonstrates that gesture on the right side of the window. In the figure, the Secondary Click feature on the left is pointed out; how it works is demonstrated in the movie playing on the right. Pretty cool, don’t you think? If you see a little v to the right of a feature’s description (Click with Two Fingers), a drop-down menu is available; click near the v to display the options for that feature. The Tracking Speed slider lets you change the relationship between finger movement on the trackpad and cursor movement onscreen. A faster tracking-speed setting (moving the slider to the right) sends your cursor flying across the screen with a mere flick of the finger; slower tracking-speed settings (moving the slider to the left) make the cursor crawl across in seemingly slow motion, even when your finger is flying. Set this setting as fast as you can stand it. Try it: You might like it.